Any person that hopes to start out as a kayaker needs to undergo a few preliminaries before they are able to take on the role as a professional kayaker. After all, it is important for you to be confident in yourself before you jump onto a one man boat and see the world. First thing is first, you need to learn how to swim on your own. You need to be able to have confidence by swimming in a swimming pool by yourself. That is the priority, because when everything is said and done, you need to qualify that if that kayak were to tip over, you will be able to swim and survive. Safety is the number one concern, and we need you to be aware of the fact that if you are not able to swim, then do not get in a kayak if it is preventable. There are some that choose to ignore this advice, and we are telling you that it is the most crucial part of this experience. You must not forget that you need to be able to swim on your own in some light clothing before you decide to jump into a kayak, because you do not want to drown in the water by trying to be super cool. After you pass the requirement of swimming on your own, you then need to undergo some other training, such as learning how to ride in a kayak. It may seem easy when you start watching some Vimeo or YouTube videos on the subject; however, you will not REALLY know how to kayak until you actually jump in and start practicing in the eyes of coach. Therefore, be sure to contact someone who is an expert on the subject and will truly be able to help you. If not, then be sure to go out on your own (after you learn how to swim on your own in light clothing) and go out for a couple of days in order to get your feet wet (literally)! Practice going around some rocks, some steep turns, while watching out for falling debris, and be extremely sure to bring a life vest with you. Even if you do know how to swim, ALWAYS BE SURE TO BRING A LIFE VEST. It is only a matter of time before someone you knows may try to jump in a kayak, not be able to swim, and end up drowning. What happens if you are far from sure, are tired, and do not want to swim? A life vest will allow you to just float in the water. On top of that, if you are injured and are too weak to swim for long, then a life vest will allow you to chill in the water while you just paddle yourself to shore. We are not able to overemphasize enough on the importance of having a life vest and really making the effort to protect your life before you jump into some dangerous waters. Just as the Titanic showed when there were no lifeboats, the most important thing to do before going any place in the water is to find the lifeboats. When you go on an airplane, the first thing I look for is the emergency exits, because if you wait until an emergency erupts to look for the emergency exit, then you are way too slow and will have to fight past everyone else that is late like you to find an emergency exit. REMEMBER, be the person that has the emergency exits already provided! Do not, and we repeat, do not be the person who sinks when the kayak goes down! You will not recover from that mistake (literally). Check out the Home Page for more information on this kayaking! If you have not read the introduction, we advise you to before you read this post. The beautiful thing about a kayak is that there are many different types of kayaks that you are able to undertake. 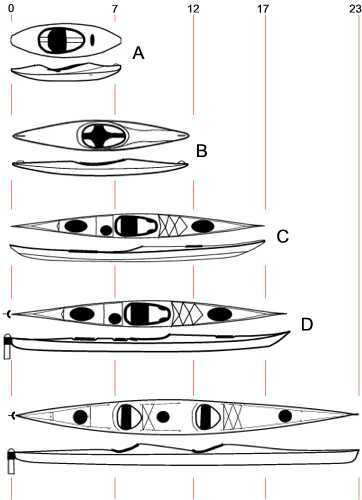 For example, there is the classic sea kayak that has been around for many, many years, even before the Europeans came and started colonizing places just because they felt like it. The sea kayak, being that it has been around for thousands of years, still works today for bodies of water such as lakes, estuaries, rivers, and not too deadly waters. On top of that, a classic sea kayaks have a long, narrow hull, fully covered by a deck. Overhanging ends are not essential continue on as long as the kayak stays maintained. When it comes to Sea Kayaking, just know that some people may not even know what that means, so we have made it a mission to tell you all a little about it! First off, here is an image of a kayak. The Kayak is something that most people should get into, in order to save themselves a lost experience. Kayaking is an amazing experience that allows you to go with the waves and enjoy a very personal experience with the water. A classic sea kayak actually has many pros that make it a fantastic resource to your arsenal of outdoor vehicles. Think about it. A sea kayak can actually go faster than you would be able to go by walk in, and it is also fast enough to go against occurrence, which is a plus. On top of that, you can put a sea kayak on top of your car. Therefore, you can take that kayak with you wherever you go, which is something that is quite amazing. In addition to that, you can take that sea kayak to the beach. Another great thing about taking the car or is that it allows you to explore some things that you would not otherwise explore on your own.